We’re kicking off 2016 with a GREAT WAY to save on travel, whenever and wherever you go. Today’s post is by my friend, Trevor Thorpe, a travel blogger and savings guru! Discount economics is the very basic business strategy of setting the price high and offering discounts or sales so that people of various financial positions can purchase the same product. It’s the same concept universities use to extract the maximum financial resources from every student: charge a ridiculously high rate and then offer “financial aid” for those with less money who are willing and able to jump through a bazillion hoops. In the end, the school gets every dollar it possibly can and those who received “aid” are thankful for the opportunity to study at a reduced cost. Almost all businesses operate under a similar model, including travel-related companies. Understanding this system helps us evaluate and maximize our discounts. There is almost always a discount available if you seek it out and sometimes there are many! 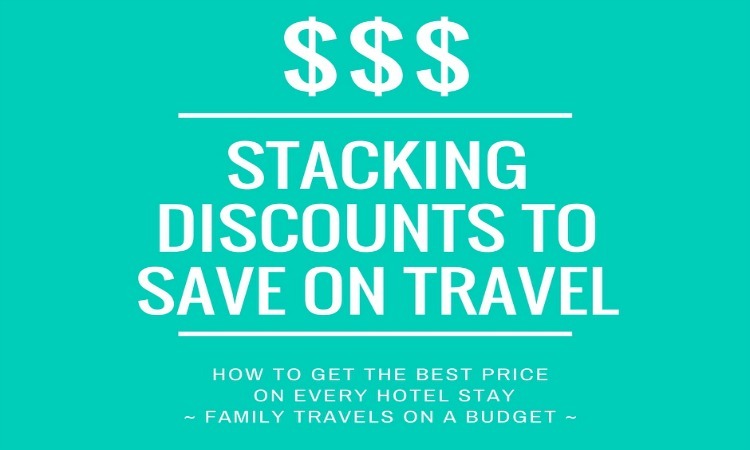 One of the most powerful tools in reducing the cost of travel is the concept of “stacking” these discounts to increase their value. Just like a casino, the travel business is set up to take as much of your hard-earned money as possible. “Best-rate guarantees” are designed to make you feel confident that you got the best rate while still overpaying. Gift cards are a seller’s boon, because they get your money knowing that many gift cards are never redeemed! There are many pitfalls to overcome to make the most of your travel dollar, but there are also some lucrative opportunities. Hotels and other businesses offer a number of discounts so that whatever discount site (Hotwire, Expedia, etc) or travel card (AAA, AARP, etc) you use, you’ll see a 5-10% discount to motivate your purchase. The secret to maximize your savings is seeking out ALL the various discounts a business is offering and finding ways to “stack” these discounts for super-savings! Many people may be aware of one or two ways to save money on travel, but knowing all the discount opportunities for a particular business, such as a hotel-chain, allows for much deeper reduction in price. Step 1: Find the lowest rate on the hotel’s website; look for a AAA rate or non-refundable rate if I’m certain of my dates. At this stage it’s also good to check for promotions that IHG might be offering its club members (you can join for free). Step 2: Compare this price to discount sites like Hotels.com or use a website like Kayak.com to compare across numerous sites. If I find anything lower with the same terms, I’ll consider using IHG’s “best-rate guarantee” to lower my price of booking directly. Currently, IHG will give you the first night of your stay for free if you find a better price, but you’ll have to make sure all the terms of the offer are exactly the same. You could also just call the hotel and ask for the better price. Step 3: Look for IHG or Intercontinental gift cards for sale online; websites like Raise.com and Cardpool.com offer discounted gift cards for a number of hotel chains (and lots of retail merchandisers, too!). Make sure to pay for the gift cards with a credit card that earns rewards so you get even more travel-bang for your buck. Step 4: Go back to the IHG website through a “portal” like Topcashback.com or Ebates.com when it’s time to actually book a stay. These companies offer you a discount for booking through them and then compensated for driving traffic to said websites. Step 5: Put it on a rewards-earning credit card. If I’m not paying entirely with gift cards, I can use my IHG credit card (10 points for every $1 spent) or another travel card to earn points. Having the IHG credit card also entitles you to platinum elite status, which often comes with room upgrades, free breakfast, etc. Result: I can typically reduce rates to 20-30% less than “rack rate” (posted retail prices) even when their are no published sales and I’ll earn hotel and/or credit card points along the way! This same system can be applied to most major hotel chains and can be adapted for other aspects of travel. Never settle for retail and don’t stop at the first discount coupon! Instead of offering the best price from the start, hotels and other travel-related businesses will test your mettle. This is your chance to show what you’re made of and get the travel opportunities you deserve. Get creative and stack those discounts! The system I use may seem like a lot of work, but the savings are essential for me to get the travel I desire, so it’s worth it. That same savings might be what it takes to get you off the sidelines and back into the travel game or it might be what allows you to finally enjoy your trip, instead of worrying about what it’s doing to your bank account! Just like the tag-line of my website, use your new knowledge of discount economics and stacking to DO MORE AND LOVE EVERY MINUTE! About Trevor: This guest post was written by Trevor Thorpe, a writer and travel planner with an absolute passion for all things travel. Not yet 30, Trevor has visited over 40 countries and unearthed a lifetime of knowledge about the intricacies of efficient and wallet-friendly travel. If you enjoyed this post, please share your comments and consider visiting his website www.ThorpeTravelSite.com for more travel advice and some excellent trip reports! great tips. you provided information that have never thought about. i will share this with my step mom she travels a lot. Great tips! We need to find all travel deals and then need to compare all things so that we can find a best deal!! We are so in need of a vacation but put it off due to time, money etc. I didn’t now you could use ebates to book vacations with though, I have to look into that. I really need to put into practice all of these tips! I don’t really think much of it when I travel…I just book and go! I hope you bookmark the page and refer to it as you plan your vacations! It does seem like a lot of work, but saving money is definitely worth it. I dn’t travel much, but I will remember for when I am able. I travel a lot — with lots more this year (son’s graduation and wedding in Birmingham). All savings I can get, I’ll take! These are great tips! We also follow a airfare site that alerts us for $58 and $78 for flights, that helps us save a ton of money! Me too. Learning how to stack the savings is making a difference in my 2016 travel budget already! I never thought of stacking travel discounts before, but I always use my AAA discount. I will have to remember these tips when I book our summer vacation! I’m learning. The step by step walk-through is a huge help for me. Thank you for these lovely tips! I’m sure they’d come in handy when I plan to travel. I so love the bottom line: SAVE MORE, SPEND LESS! I’m great and getting discounts on everything I buy except flights. I’m taking all the notes so I can apply them. Good luck, Mimi! Happy travels. I have not heard of IHG rewards but we have been using our American Advantage citicard for years and it has enabled us to book many free flights even to Europe. I love all of those reward programs. Check to see if your favorite hotel chain has a rewards card or use hotels.com, etc. to save. Book with that American Advantage card and earn miles while saving on lodging. That’s exactly what stacking is all about! Great tips! I feel like I never get a good deal. I am going to have to try these out! I always try to get the best deal I can, but then I stupidly look for other deals I might not have considered and find one I missed. I like the checklist in this post — it should help me remember to do all my checking BEFORE I book! Great tips! We don’t travel that much, but when we do, we love to find good deals on the best flights and hotels possible. Thanks for sharing this, we’re planning a big international trip in 2017 and these will surely help us save! These are great tips to save on travel expenses. I often try to look for AAA discounts and see if I can stack them with any promotions the hotel is running. It’s great when I can save some extra money on hotel bills! I agree wholeheartedly! I am also a fan of calling during regular business hours (between 11-2 is best it seems) to ask for best price in lieu of discounts online. I often save a few extra dollars, and it only takes a minute. I have the IHG rewards and I’ll definitely use these tips the next time I need to book a hotel room. I’m all about saving money when traveling. I was surprised to see how stacking can add to the savings. I always knew about using a gateway, like Ebates, but I didn’t know the tip with the gift cards too. Awesome! We have had such great success with the rewards credit card for a particular airline. Thanks to the points we earned on it, we now have a free companion pass to use for the next calendar year which means some weekends away together! That’s awesome! I have a Delta rewards card and will be traveling free in April. Such a huge help to the budget! How does that one work, Trevor?